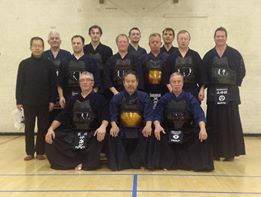 We had a Hatsugeiko session at my local dojo on the evening of January second. Luckily this coincided with a visit from Hasegawa Makoto sensei, former JICA teacher to Nepal. He had contacted Holt sensei during a sightseeing visit to London and ours was the one practice that fitted in with his schedule. The session format was the one I normally suggest when we have senior visits. We started with kihon geiko, had a brief interlude for keiko between the kodansha and then finished with motodachi- geiko. We had a glass of sake to toast the New Year and then moved to the pub for a chat. 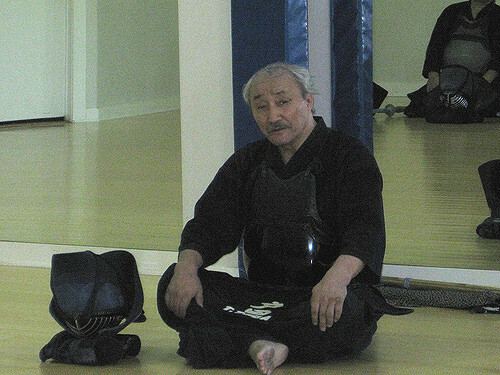 We asked Hasegawa sensei for a critique of everyone’s kendo and the point that he made was that people tended to use too much shoulder power. Many individuals made a cutting motion with their arms moving in parallel. 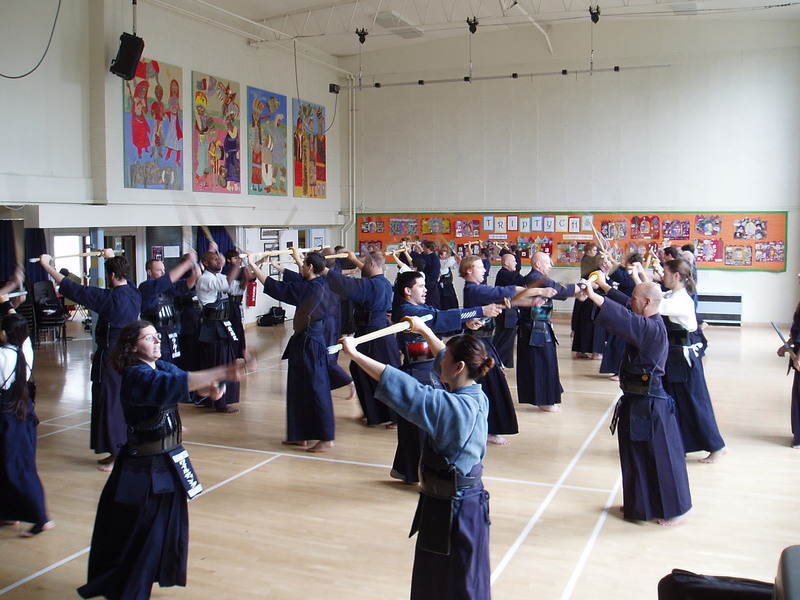 Instead he suggested that they should rather push up and out with the left hand and pull up with the right, so that the shinai makes an even arc as they raise and strike. He also commented on the need to grip only with the middle, ring and little fingers and not the forefinger and thumb. This applies to the grip in kamae, when striking and when making tenouchi on the point of hitting. I have often heard theories about westerners having different physical characteristics and that Japanese tend to concentrate more strength in their core and lower bodies because of “tatami lifestyle”, but to be frank I find these hard to believe. Most young Japanese people now use chairs and sleep in beds. 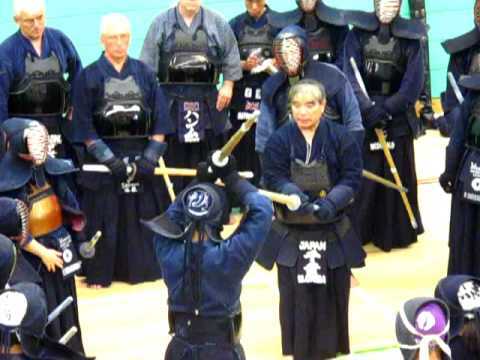 I also see Korean and Japanese people who have started kendo outside their own countries, develop the same heavy hitting style as their Caucasian chums. I believe the remedy is in the quality and quantity of basis practice we should do. Chiba sensei once said that leading up to his All Japan Championship peak; he did 3000 continuous suburi per day. Not only does repetition lead to perfection, but working at that level of intensity teaches you to relax and save energy. In the same vein if you regularly practice flat-out uchikomigeiko or kakarigeiko you learn to conserve energy by not being unnecessarily tense. 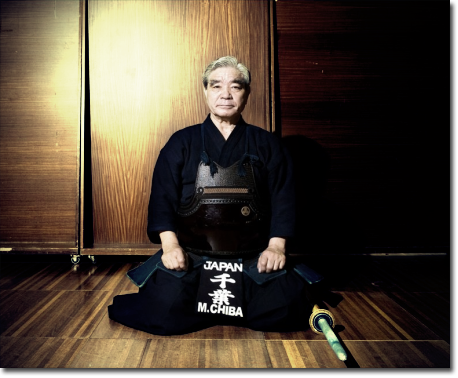 The other point to consider is that correct breathing helps you to relax, so by practising multiple strikes with one breath in kirikaeshi or kakarigeiko you learn to use the power of your tanden instead of your shoulders. Old advice, but certainly worth taking into account for this year’s training. 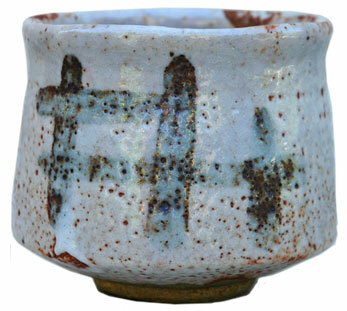 There was some interesting feedback on last week’s post, most of it on the meaning of jiri itchi. As ever, George did a great job in providing the precise definition. I would like to take the discussion forward one more step, and look at what we need to do to achieve jiri itchi. The answer is fairly obvious. Practice until the technique, the timing and the opportunity become second nature. Only then will you be able to launch that waza “on demand”, without giving it conscious thought. When on the few occasions senior Japanese sensei compliment anyone’s kendo, they often do so by saying that “you have done lots of keiko”. 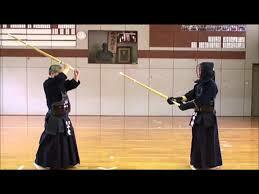 Not ” your kendo is good”. It is as if the hours of training you put in at the dojo automatically equate to merit. This runs through to formal evaluation at grading exams where, the pass criteria for almost every grade are subject to the caveat, “must be seen to have done an appropriate amount of keiko”. It is true also of the requirement for referees who must be active in their own keiko schedules and not just involved as referees and teachers. The view is that if you are not regularly polishing your own repertoire of techniques, you will not be in a position to judge those of others. Of course it is not just a matter of putting in the time in the dojo. Training has to be correct and strenuous to be of value. I have forgotten who said it, but whoever it was said “the more I do of what I do, the more I get of what I’ve got”. Thinking about this in a kendo context it means that if you spend hours training to do a technique incorrectly, you will master the art of doing it wrong. Obviously it pays to build step by step on technique training. Start with suburi, practice the timing and distance in uchikomi geiko, learn how to get the technique past your opponent’s centre with kakarigeiko and only then incorporate it into jigeiko. Chiba sensei when speaking about his training before winning the All Japan Champioships talks about doing 3000 suburi in a single session. This is as a police tokuren who already had extensive high level keiko and shiai experience. Of course the concept of improvement through constant repetition is as old as kendo itself and was most famously promoted by Yamaoka Tesshu. None of us will ever achieve perfection in our kendo, but trying to do so should be a source of satisfaction in itself.